Artimus Albosa is joined by Dirk MacGirk and new panelist Bardghost Isu, guests Harvey Skywarker and Apple Pear to talk about ‘The Great Escape’ of Pandemic Legion and Holy Meteorite Coalitions supercapital force from their bubble camp in UALX-3 and all the controversy surrounding the metagaming of reddit opinion as to the true condition of those Supercapitals. We also pivot to the north and look to how the second front is shaping up and the significance of 2 dead Keepstars at the hands of The Imperium. Goonswarm fields polarised weapons with The Mittani in an Augoror Navy Issue in an AT match. All the commentators bet against Bastion pre-match as Quebec United Legion cause drama just before the match starts. The new Triglavian ships seem to be very popular in various comps due to their lower point cost, ramping DPS, non-concessionary utility high slot availability and new “no duplicates” rule. So much wild conjecture on the part of Legacy being spun up by a propaganda drama machine spearheaded by PL especially Doomchinchilla. Alleged abuse turns out to be fabrication as PL and the holy meteorite coalition time an escape to perfection logging in supers titans and faxes, kill bubbles and align out until clear and jump with scheduled DT mere seconds away to provide a safety net for Supers unable to make it clear in time. 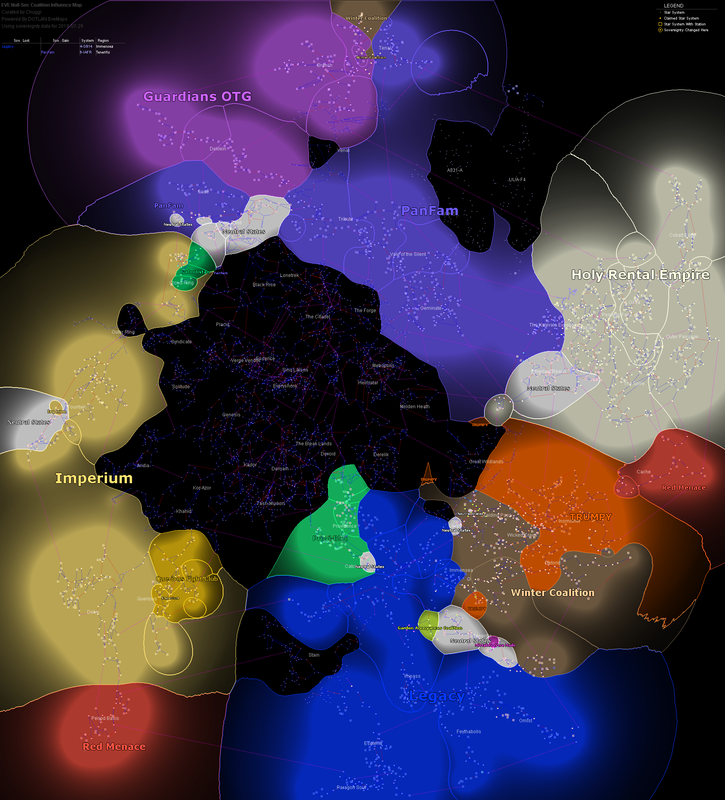 Whilst Supercapitals are trapped Legacy make very little ground on the front lines barr the successful onlining of their Keepstar in UALX. PL and Holy Meteorite coalition successfully counter a proactive push by Legacy against their staging fortizars using capitals and subcapitals. Time will tell if the freed supercapital forces are fully utilised the way they were on the 4-GB Keepstar or if their near week long immobilisation in UALX has created a less brash desire for them to be used as the Apex Force they have been used as previously. INIT display Heart formation atop the wreck of the SC Keepstar. Waffles Keepstar in Kinakka dies to Imperium uncontested. Although several other Keepstars have been reinforced, sov upgrades that denies easy full escalation to supercapitals cannot be installed in Low Sec, providing an easy target for Imperiums massive armor supercapital forces. 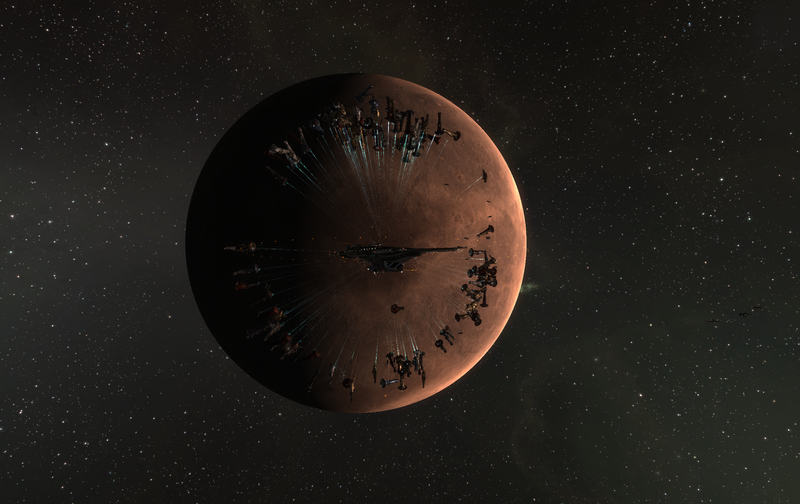 Img of the P7-45V Keepstar final timer fight BR betwseen newly formed DRFdot coalition and RED Alliance and allies.